Zoe Zebra Pink Ruffle Toddler Car Seat Cover is a fun and chic zebra car seat cover. This pink ruffled girl's car seat cover makes spills and messes super easy to clean with the removable seat cover. So easy to use, this fashionable car seat cover snaps in and out for easy access to the car seat straps. Simply slide the straps through the inserts and snap closed. Made of woven polyester blends, this pink ruffled zebra baby car seat cover is both stylish and practical. 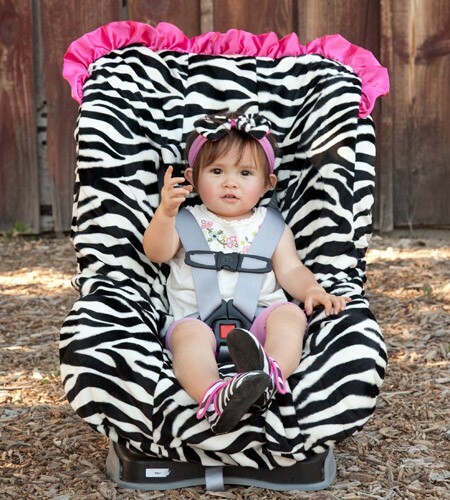 Zoe Zebra toddler car seat cover is compatible with Britax Marathon and similar toddler car seats.